The Motorola RAZR HD's big battery definitely lasts a little longer than many of its competitors, giving it a slight advantage. This is a well-built smartphone with some intuitive software but the RAZR HD's industrial look and feel won't strike a positive chord with everyone. Boasting a huge 2530mAh battery, 4G connectivity and a large 4.7in screen, Motorola claims the RAZR HD is an "all day" Android phone. The RAZR HD definitely lasts a little longer than many of its competitors, giving it a slight advantage in the battery life stakes. It's a well-built smartphone with some intuitive software but the RAZR HD's industrial look and feel won't strike a positive chord with everyone. The hidden notification LED below the Motorola logo at the top is a really nice touch. The RAZR HD has stuck to the industrial looking trend that Motorola favours on its top-end smartphones. Whether you like this style will depend on your personal tastes. Among the distinctive touches include two visible torx screws at the bottom, a SIM card tray on the left that needs an eject tool to open (much like Apple's iPhone 5 and the HTC One X) and well placed power and volume buttons on the right that provide good tactility. We particularly like the slim power button, which has grooves carved into it to provide a better grip for your thumb. The hidden notification LED below the Motorola logo at the top is also really nice touch. 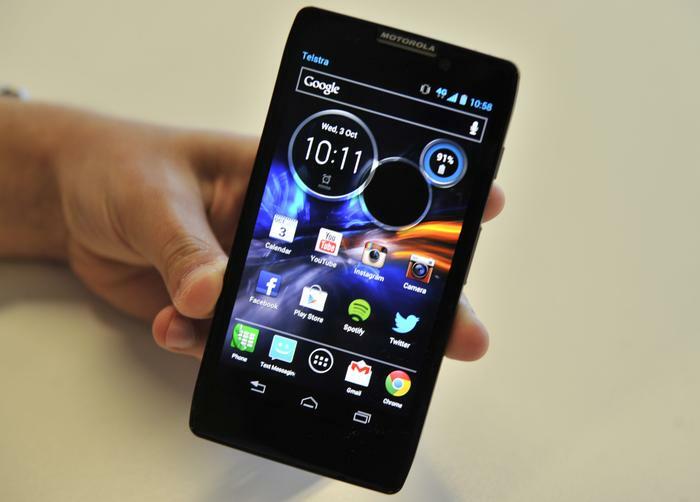 Motorola describes the RAZR HD as "the world’s most compact 4.7in smartphone." It measures 8.4mm thin which is quite an achievement considering the large 4.7in screen size and that huge battery. With that being said, this is far from a small phone. It's slightly thinner than the Samsung Galaxy S III but the RAZR's squarer design and sharper corners gives the impression that it's thicker. The phone also weighs more than most of its competitors at 146g, though we didn't find it overly heavy during general day-to-day use. If you're coming from an original RAZR smartphone, you'll find the RAZR HD has much better ergonomics and is far more comfortable to hold and use single-handedly. The RAZR HD is thinner than the Samsung Galaxy S III but the squarer design and sharper corners give a different impression. The RAZR HD's build quality is excellent. Motorola has retained many of the features that made the previous RAZR and the newer RAZR V rather distinctive. 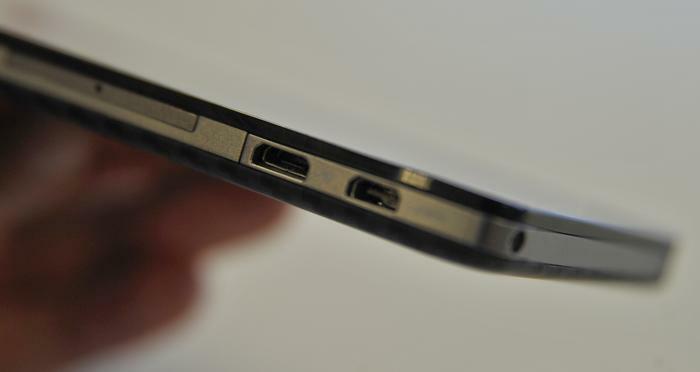 The rear of the phone has a Kevlar fibre backing that the company says makes it sturdier than most other smartphones. The RAZR HD is also coated in a splash-guard treatment that makes it "water repellent", aiming to protect both the outside and the internal components. The splash-guard treatment works as well as Motorola says — any water drops on the handset simply slide off the surface easily, much like water beads rolling off a car when it's just been polished and waxed. Keep in mind the coating makes the RAZR HD water-repellent, but not completely waterproof. The RAZR HD's build quality is excellent. There are no moving parts and the casing doesn't creak or rattle when pressed. We did find the SIM eject tray was a little difficult to remove as it needed a bit of force to pry open. We also dislike the fact that to access the microSD card you'll need to remove the SIM card, too. Unless you're regularly swapping your micro-SIM or microSD card, though, this isn't a significant issue. The RAZR HD's build quality is excellent. There are no moving parts and the case doesn't creak or rattle when pressed. The Motorola RAZR HD has a large 4.7in super AMOLED screen with a 720p HD resolution of 1280x720. This gives it a pixel density of 312ppi, comparable to the best flagship smartphones on the market. The screen displays crisp and sharp text with minimal, visible aberrations, but it does have a tendency to oversaturate colours when compared directly with the iPhone 5, especially skin tones. The RAZR HD displays more vibrant images than the iPhone, though its black levels aren't as deep. The RAZR HD's screen is coated in gorilla glass, which aims to prevent scratches. The Motorola RAZR HD has a large 4.7in super AMOLED screen with a 720p HD resolution of 1280x720. Motorola says it "revamped" the user interface on the RAZR HD. The Motorola RAZR HD comes with the 4.0 Ice Cream Sandwich version of Android, though the company says it is "hopeful" an update to the latest 4.1 Jelly Bean version will arrive by the end of the year. 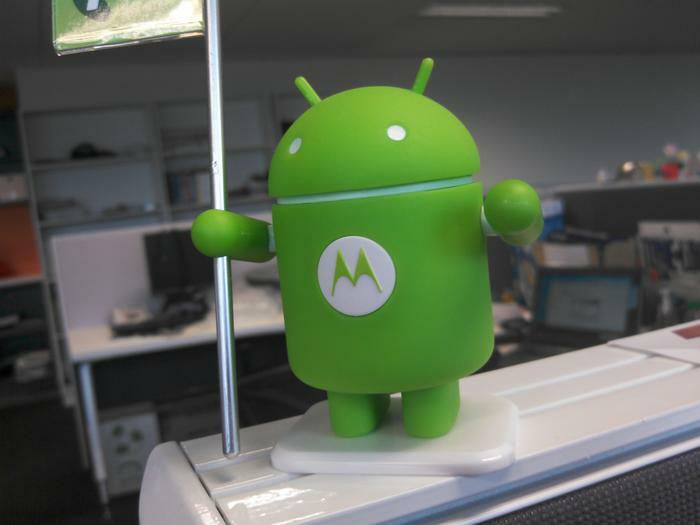 The update will need to be tested and approved by Telstra, who is the exclusive carrier selling the phone in Australia. Previous Motorola phones have been criticised for poor UI overlays but the company has clearly listened to consumers. 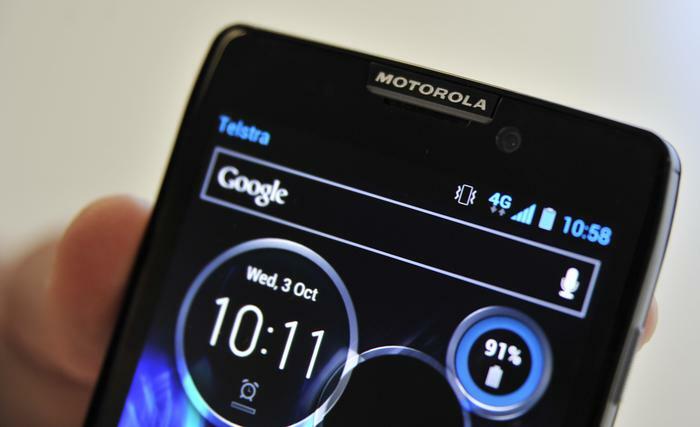 At the RAZR HD's Australian launch event, Motorola says it "revamped" its user interface because users find Google's mobile operating system "fairly complex". 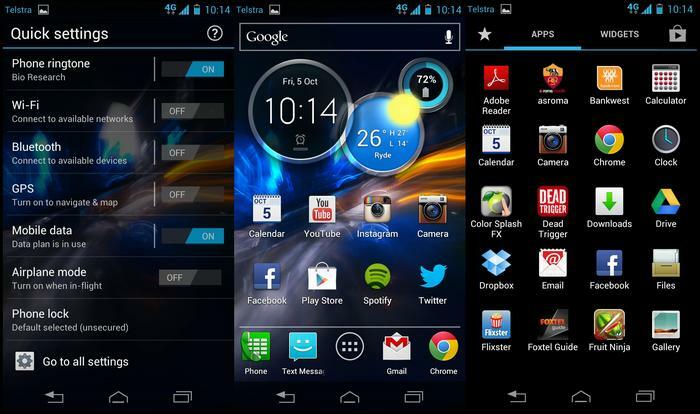 The look and feel of the RAZR HD's interface is very similar to Google's stock UI on the Samsung Galaxy Nexus. From left to right: The quick settings home page, the default home screen and the app drawer. There's a few subtle but appreciated touches on the RAZR HD. The lock screen allows you to swipe to the right to unlock the screen, swipe to the left to jump immediately into the camera app, swipe up to access the phone menu and swipe down to jump into text messages. A small switch on the top right corner of the lock screen also puts the RAZR HD into silent mode. By default the RAZR HD is set up with a single home page. A swipe to to the right lets users add a blank or preset template page, while a swipe to the left shows a quick settings menu that includes the ability to change the ringtone, toggle Wi-Fi, Bluetooth, GPS, mobile data and airplane mode and change the default screen lock option. There's also a link to all settings on this screen. A question mark next to each setting lets users learn more about each item in the list, a great feature for first time Android users. From left to right: Motorola's favourite menu, the Smart Actions app and the handy Guide Me app. A favourite apps tab in app drawer is a handy feature. Motorola's circle widget is another nice feature. It displays three circles that include a clock, a weather forecast and a battery life indicator. A simple swipe on each circle will flip between different modes, like showing a digital or analogue clock, adding a city to the weather widget and adjusting notifications settings. New text messages, missed calls and voicemail notifications will conveniently appear instead of the clock when active. Other Motorola widgets include a "favourite contacts" widget that lets you swipe down on it to show up to 20 contacts with an image, along with a "Drive Smart" widget that can be set to activate a specialised car menu when you're driving. There's a favourite apps tab in app drawer, which allows users to add selected applications to appear in that menu. A setting that automatically adds future downloaded apps to this favourites menu is another nice touch. Motorola also includes the Swype keyboard as a pre-loaded option, though you'll need to activate it from the settings menu. 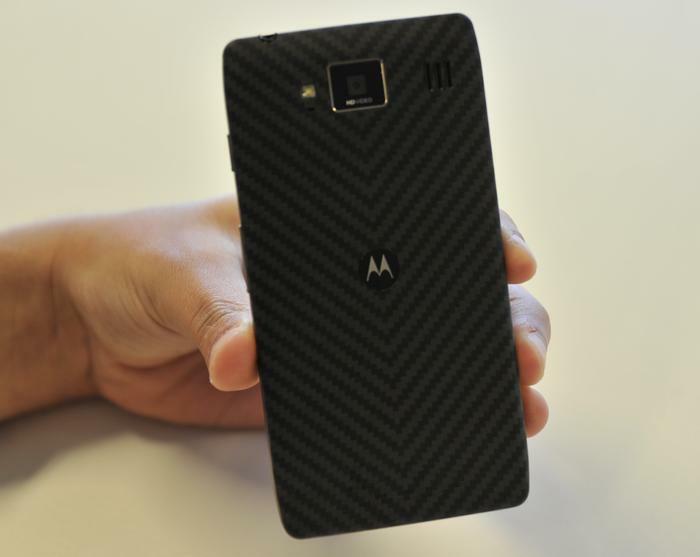 The rear of the RAZR HD has a Kevlar fibre backing that's coated in a splash-guard treatment. 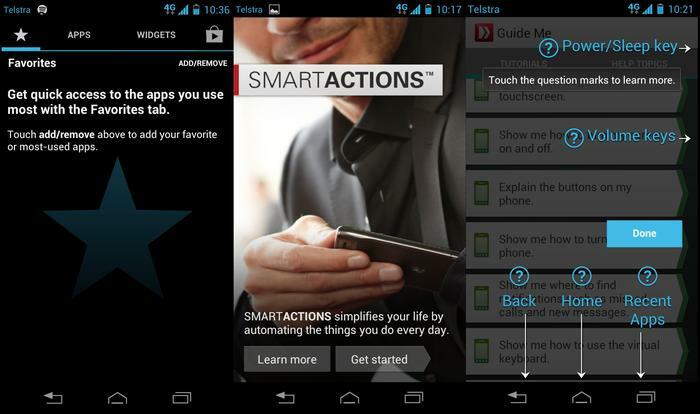 Motorola has once again included its excellent Smart Actions app on the RAZR HD. This automation app allows you to preconfigure tasks so you don't have to do the same things over and over again. As an example, Smart Actions allows you to set up an action that will automatically begin playing music when you plug in your headphones, automatically set your phone to silent when you nominate a location as a "quiet location" and even turn on Wi-Fi and turn off Bluetooth (or adjust a wealth of other settings) when you get to the office, or arrive home. The app uses a combination of location based and user nominated settings to automate tasks and you can create and activate as many as you like. Motorola's Guide Me app is a handy inclusion for first time users. It runs you through basic tutorials that cover general usability, apps, calls and contacts, settings, and messaging and calendar details. It includes an interactive, step-by-step guide with highlighted screen taps and instructions. We found the Motorola RAZR HD fast and responsive straight out of the box. We found the Motorola RAZR HD fast and responsive straight out of the box. The phone is powered by a 1.5GHz dual-core processor and 1GB of RAM and these internals handled most graphic intensive games with ease. We didn't experience any regular lag or slowdown during day-to-day use. However, there are still some basic elements in Google's Ice Cream Sandwich software that aren't as smooth as both iOS and Windows Phone platforms. As an example, opening and closing the app draw offers a slightly stuttering animation. 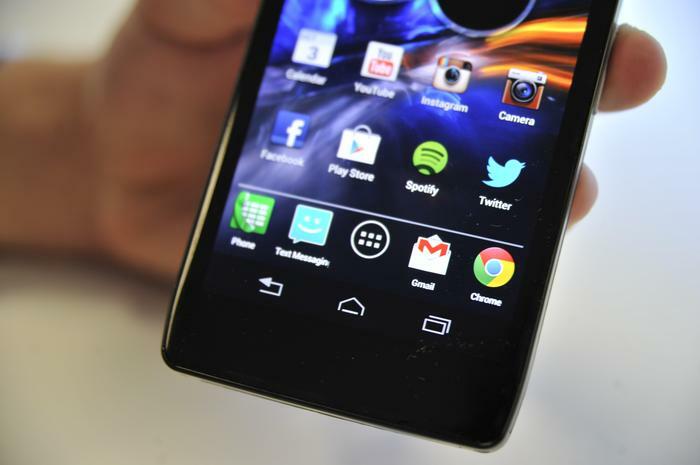 We expect these small issues to be ironed out once the RAZR HD is updated to Jelly Bean. A photo we captured with the Motorola RAZR HD (click to enlarge). As previously mentioned, the RAZR HD is a 4G compatible phone in Australia and it's exclusively sold Down Under by Telstra. We managed to achieve download speeds of up to 30Mbps, but your ultimate speed and coverage will depend on a number of factors including location, network congestion and time. The Motorola RAZR HD has an 8-megapixel camera with single LED flash. The camera app itself is both slick and fast, with minimal time between photos if you are quick on the shutter button. We love the fact you can use the external volume keys as zoom buttons, and you can even set the volume buttons to act as a shutter key, if you wish. Images captured with the RAZR HD's camera offer high levels of detail but do suffer from plenty of image noise. We also found the autofocus a erratic when trying to take macro shots. The camera doubles as a full HD 1080p video recorder and the quality is decent for a smartphone with good detail and a sharp image overall. The video recorder features some interesting settings including a time lapse mode and a wind reduction mode that aims to eliminate noise when recording in windy conditions. Motorola says it focussed heavily on improving the battery life of the RAZR HD by equipping it with a large 2500mAh battery. Given the 4G connectivity and large screen, the RAZR HD does well to last a full day but it wasn't as impressive as we'd have hoped. We found the screen in particular was the biggest battery drainer, often accounting for over 75 per cent of the battery on our review unit. If you're using the RAZR HD the battery will drain relatively fast, but it's fairly efficient in standby. The Motorola RAZR HD is available exclusively through Telstra stores and online in Australia.